3 surge-protected outlets. Shield your valuable devices from damage caused by power surges. 3 USB charging ports. Connect your USB devices to the USB ports to charge them. Features a built-in stand to hold your tablet or smartphone while charging. Designed for placement on your desktop. Output specifications: USB charging output (total amps): 2.1A; receptacle style: NEMA L5-15R. Input specifications: nominal input voltage: 120 volts; input power: 1,440 watts; input frequency: 60 Hz; input connections: NEMA 5-15P; input breaker capacity: 12 amps. Surge energy rating: 1,080 joules. 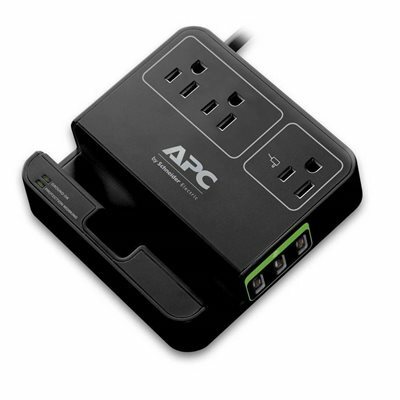 The APC Essential SurgeArrest P3U3B protects your electronic devices from surges and spikes during the charging process. This 1080 Joule surge protector and charging station features three surge protected outlets and three USB charging ports. The P3U3B surge protector has a 6-foot power cord and a built-in smart device charging stand that enables you to use your device while it is charging. Two LED indicators inform you of any faulty unit and wall wiring issues. The P3U3B uses state-of-the-art circuitry to protect sensitive electronic equipment from dangerous power surges and multiple surge events such as lightning. Reliable thermal fusing helps ensure safe operation under all conditions. Its three outlets and three USB charging ports allow you to charge multiple devices simultaneously while keeping them protected during the process. The built-in smart device charging stand ensures easy access to your smart devices while they are being charged. The noise filter of the P3U3B surge protector/charger reduces electromagnetic interference (EMI) and radio frequency interference (RFI) to block unwanted line noise, thus ensuring better performance of protected equipment. It also helps prevent equipment lockup. The P3U3B has been tested and approved to work safely by a third-party Nationally Recognized Testing Laboratory (NRTL). The APC P3U3B surge protector/charger features a Ground OK LED to warn you of potentially dangerous wiring problems in the wall circuit. The Protection Working LED warns you if the surge suppression circuitry has been damaged by a heavy lightning strike or power line surge and the SurgeArrest is unable to provide 100 percent protection. APC will replace your damaged SurgeArrest P3U3B free of charge. *APC will pay to repair or replace properly connected equipment if damaged by a power transient while connected to an APC surge protector. See Equipment Protection policy (included with unit) for details.